The Signalkuppe is home to Europe’s highest-altitude building: the Capanna Regina Margherita. Giovanni Gnifetti (parish priest of Alagna), Giuseppe Farinetti, Cristoforo Ferrari, Cristoforo Grober, Giacomo Giordano, Giovanni Giordano and two porters. Eat a Pizza Margherita. The Capanna Regina Margherita (Margherita hut, see below) is named after the Italian queen (1851–1926). The pizza-bakers of Naples created the Pizza Margherita in her honour. Mountaineers tackling the Monte Rosa massif today do so primarily on a high-altitude tour taking in the Signalkuppe and the Capanna Regina Margherita, the highest-altitude building in Europe. The Signalkuppe is Switzerland’s fourth-highest peak and forms a prominent topographical corner as the long chain of 4,000-metre peaks branches north here to the Nordend, Strahlhorn and the Mischabel group. Seen from the south and south-east, the Signalkuppe is the most prominent summit with its cliffs and steep glaciers. The mountain stands on the Italian-Swiss border, which was relocated in 1941 in favour of Italy. 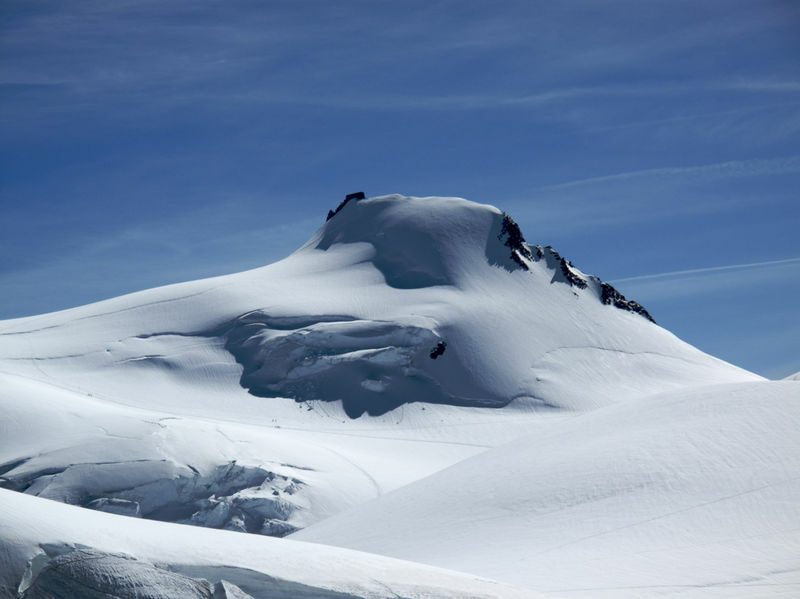 The Monte Rosa massif has about ten peaks higher than 4,000 m: Dufourspitze, Grenzgipfel, Ludwigshöhe, Nordend, Parrotspitze, Balmenhorn, Schwarzhorn, Signalkuppe, Vincent Pyramid, Zumsteinspitze. Ludwig Freiherr von Welden named the mountain the Signalkuppe (“Sign summit”) in 1825 after a prominent pinnacle on the peak. This spike was removed during the building of the Margherita refuge. The Italian name of Punta Gnifetti derives from the first person to climb the peak, Don Giovanni Gnifetti, parish priest of Alagna. His eight-man rope team made the first ascent on 9 August 1842. Gnifetti had already made unsuccessful attempts to conquer the mountain in 1834, 1836 and 1839. Gnifetti’s mortal remains were buried on the Signalkuppe in 1867. The Capanna Regina Margherita stands at 4,554 m and is Europe’s highest-altitude building. It was inaugurated in 1893, and named after the extremely popular Margherita of Savoy. The Italian queen had a passion for the mountains and did not miss the opportunity to visit the building in the year it was built. The refuge is owned by the Varallo section of the Club Alpino Italiano (CAI), has a warden service from mid-June to mid-September and during this period can sleep up to 70 mountaineers. The winter room with 12 beds is open during the rest of the year. The hut also houses an international centre for high-altitude physiological research and has the highest-altitude telephone connection in Europe.